Starting a unique business focusing on the environment and the natural wonders in the Fox River Valley. Fox River Kayaking Company is dedicated to Wisconsin, the Fox River, and all people interested in the culture these environments cradle. Providing superior quality experiences across the Fox River Valley; we assure safety, education, and a family-fun experience on the water. We are passionate, rebellious, and spirited leaders that work as a team inspiring preservation, well-being and the adventure of life! 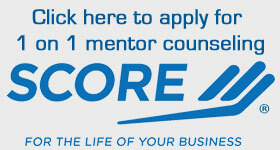 Learn about SCORE here in the Fox Cities and hear some of our clients success stories. Help us celebrate on May 3rd. at our Gala Reception. Co Sponsored by Fox Community Credit Union. What Makes The Mosquito Squad Different? Planning a startup for a small business. Building a small specialty business. Providing services to a wide range of individual and business clients.